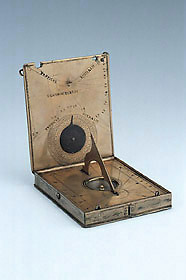 This is an anonymous instrument incorporating two sundials, a compass, a lunar volvelle, and an astronomical table. It has just two hinged parts, in an undecorated and rather austere style. However, unlike a diptych dial, where the upper leaf often has a vertical dial and the two leaves must therefore be fixed at right angles to each other, the two sundials of this compendium are both for horizontal use.